Syntypes: BM 1947.2.24.81-82 (formerly 1906.3.30.172-173), MSNG 29941 [4 specimens] (see Capocaccia, 1957 ). Type Locality: "Fernand-Vaz, French Congo" (now in Gabon). Very closely allied to H. boettgeri, Tornier, and agreeing with it in every respect except that the fingers and toes are fully webbed to the tips. Uniform blackish brown above and beneath. The largest male measures 42 millim, from snout to vent, the largest female 46. Six specimens from Fernand-Vaz, French Congo. Boulenger, George Albert (1906): Report on the Batrachians collected by the late L. Fea in West Africa. 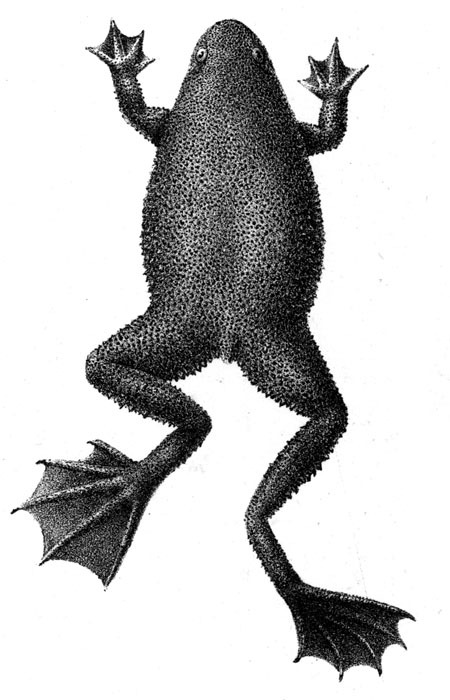 - Annali del Museo Civico di Storia Naturale di Genova, (3)2: 157-172, Plates I-II. Capocaccia, Lilia (1957): Catalogo dei tipi di Anfibi del Museo Civico di Storia Naturale di Genova. - Annali del Museo Civico di Storia Naturale Giacomo Doria, 69: 208-222.